I think maybe the eyes came out a little too big, but I still really like this fish. Especially the fins and scales have been brilliantly thought up! Right now, I’m working on the penguin from All About Ami and tonight I’m going to another Hook-In at Echtstudio, where I can get the yarn I need to get started on the afghan I want to make during my vacation. In the meantime, while I haven’t been sitting still, neither has my blog. I guess someone mentioned me on Facebook, since a lot of people got directed here in the past few days. I haven’t been able to find out where they came from, but I want to take this opportunity to thank whoever linked here and everyone who liked it enough to take a look! Well, I guess it’s back to the grindstone. Have a great everybody! 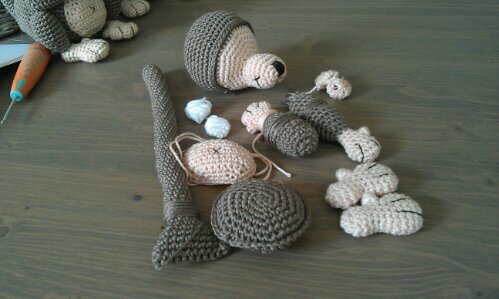 So I did what any sensible “crocheteer” would do and took to the internet. 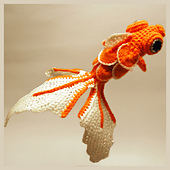 Googled around quite a bit today and put three new projects on my to-do list -_-” two patterns by All-About-Ami: a penguin and a little dragon, and one from a French crochet-blogger called Semperly: it’s an awesome crochet goldfish. So what I really need now is for the weather to cool down so I can get cracking on my projects again! What do you do with your time when circumstances prevent you from practising you hobbies? My fifteen minutes of fame have come and gone and now it’s back to everyday life. This week, I finished the three monkeys I’d been working on. They were loads of fun to make and actually came out pretty cute (if I may say so myself) but I don’t think I will recreate them anytime soon for myself. I’m never very fond of having to make the same thing multiple times and this time, I had to make everything three times. Sometimes even six, like with the legs, arms, ears and whatnot. 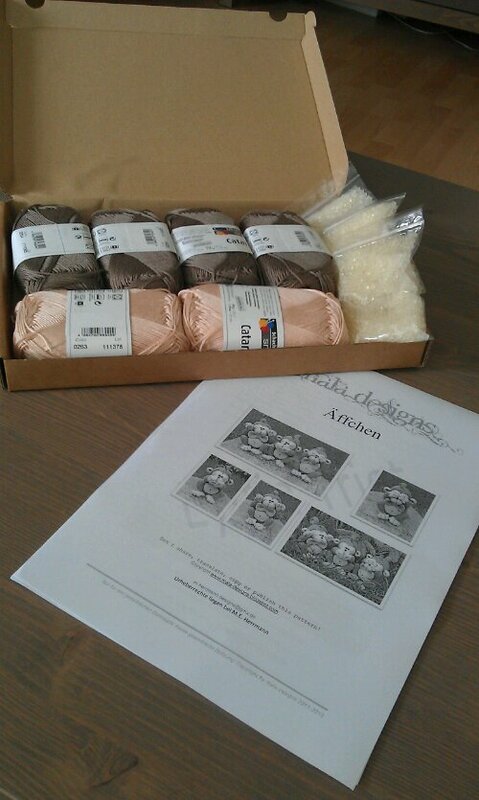 For the full set you need three skeins of taupe and three different colours for the bows. If you want to make your own set of monkeys, the pattern is from Mala Designs and can be found here. It is entirely in German, but thankfully, it has loads of pictures and the way it’s written is pretty much the same as any pattern I’ve used so far. These past few days have been quite eventful for me. I’ve been working on the monkey project, which is getting there steadily. Just one more monkey to go and most of its parts are done. This September, my boyfriend and I will be going to Greece for ten days. I’m pretty excited, but also bumped into a slight problem: I don’t want to bring all the stuff I need for amigurimis with me (stuffing, eyes, needles and whatnot), but I think I might go crazy if I don’t bring a project with me to work on in the evenings or lazy afternoons! So I’ve decided that I will make an afghan while on our little trip. I fell in love with a pattern, but I’m not really sure if I will be able to pull it off. So far, every project that is not an ami ended up in my bog box of unfinished projects and junk… But I will certainly give it a try! I have send the typed out pattern to All About Ami and asked her if it’s ok if I post it here. Since she wrote the pattern I based mine on, I believe it is only decent to ask her opinion first. I hope she doesn’t mind, cause this minion has been getting a lot of attention! And this week I finally got to see Despicable Me2! I completely fell head over heels for the ‘evil’ purple minions, so now I really feel the need to crochet some of those as well! So in short, it’s been a busy week and I’ll probably be busy for a few more! Stay tuned for pictures of the complete monkey set! Find Ana Paula on facebook here! Lions and Tigers and.. Daleks?! Oh my! They are now on their way to a friend of mine in America, who offered to take the lonely elephant in right away when I posted the last batch of cupcakes. There are two Takochu in this picture as well, because my friend also requested those. I just love to make these little guys! They make great keychains or little danglers for on your handbag. And probably the biggest plus is that they are really easy and quick to make! I can get one done in less than an hour, so it’s really no sweat to whip them up. I am glad however, that I switched from safety eyes to little half pearls that I glue on. The Takochu are just too small to really work well with the safety backings, making their eyes bulge out a bit. Plus, they are too small either way to be given to little children, so child-proofing them isn’t really an issue (I think). Together with this, some random Dutch stuff went in the package and I really hope my friend likes it. The pattern for the Dalek can be found here. The pattern for the Takochu can be found here. The patterns for the animal cupcakes came from a Dutch pattern book. So, a big project coming up: three monkeys. I guess they are depicting ‘see no evil, hear no evil, speak no evil’. My cousin sent me a picture asking if I could make them for her. A bit of googling later and I had found the pattern for the monkeys. It’s going to be a bit of a challenge, because the pattern is in German. But I think I’ll be alright. Also, this will be my first time working with plastic granules to weigh the amigurumis down a bit. Hope it will work! Does anyone reading this have any experience with working with granules?